Cabinet members at Chichester District Council have approved an ambitious business plan which is looking to expand the current success of Chichester's award winning Novium Museum and Tourist Information Centre (TIC). The plan aims to build on the achievements of the last few years, whilst increasing the museum income in the longer term in order to reduce operational costs. When compared to the former Chichester District Museum building, the new museum and TIC in Tower Street is already more cost efficient. The museum and TIC budget for 2017-2018 was almost £33,000 less than the operational budget for the last year of the old museum and TIC when inflation is taken into consideration. Visitor numbers have also remained steady since free entry was introduced in November 2014, ranging from 45,000 to 52,000 per year. 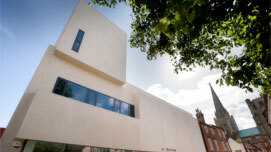 "Since opening in July 2012, The Novium Museum has quickly become a much-loved museum for residents and visitors to learn about the district's history," says Councillor Eileen Lintill, Cabinet Member for Community Services at Chichester District Council. "Exhibitions such as Tim Peake, Cutlasses and Contraband, Game Plan and Bricks Britannia have positioned the museum as a vibrant and active heritage destination and have attracted visitors from across the country. This has helped the museum to diversify its audience and appeal to a wider range of people, which we hope to continue to do in the future. "Compared to figures from the running of the old museum and TIC in 2010-2011, the Novium Museum and TIC has proven to be more cost effective and offers better value for money. This is without even considering the rental income generated from the former TIC building, which is almost £50,000 per year. "The current building is more modern and environmentally friendly, which has also further reduced costs. "Going forward, it is important that we not only look back on the successes of the service but also plan ahead to ensure that the museum continues to offer residents and visitors the best possible service. The new business plan will set out an ambitious strategy for the next five years, enabling the service to build on its current success and work towards an even stronger position, both in terms of reputation and resilience." diversify and increase funding streams. Chichester Camera Club is currently the headline exhibition at the Novium Museum, until 10 March 2019. The exhibition features the rich history of Chichester Camera Club and it development over the years. Drawing from the club's archives, from the Novium Museum's social history photography collection and with contemporary work, this showcase also explores the way in which Chichester District has been a source of inspiration to the club's members across a range of photographic genres. To find out more information and to see what's on, please visit The Novium Museum .